Solution: Hydrogen iodide, HI, decomposes in the gas phase to produce hydrogen, H2, and iodine, I2. 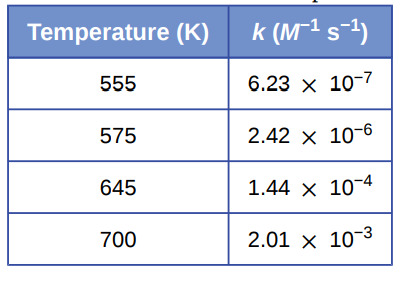 The value of the rate constant, k, for the reaction was measured at several different temperatures and the data are shown here:What is the value of the activation energy (in kJ/mol) for this reaction? What is the value of the activation energy (in kJ/mol) for this reaction? Does the orientation factor depend on temperature?